(PhysOrg.com) -- Scientists from the US and UK have discovered four new species of parasitic fungi in the Brazilian rainforests. The fungi attack four distinct species of ants and release mind-altering chemicals that gradually turn the ants into zombies and then kills them. David Hughes, Assistant Professor of entomology and biology at the Pennsylvania State University, and colleagues found the new fungi, all in the Ophiocordyceps unilateralis species complex, in the Zona da Mata area in south-eastern Brazil. Each fungus species was a different shape and size and was found to be parasitic on a different species of carpenter ant (Camponotus sp). Ants that come into contact with the fungus spores become infected, and within a week they begin behaving like zombies and leave the nest. 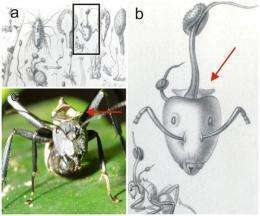 They then find a shrub leaf in an exposed position a short distance above the forest floor and lock their mandibles onto the central vein or the leaf edge and die in that position. The fungus sprouts spore-bearing stalks out of the back of the neck of the dead ant and releases its spores at night, which float down to the forest floor ready to infect more ants. Two of the species bore short spores that changed to a boomerang shape in mid-air. If the spores did not land on an ant they sprouted secondary spore stalks that could infect ants walking on them. The other two species bore longer spores that were shot like arrows from the stalks, but which did not grow secondary stalks. The researchers are not certain how the fungus controls an ants behavior but said it consumes the ant from the inside, releasing alkaloid chemicals as it does so. The chemicals released by the Cordyceps group of fungi have been known to traditional medicine for millennia, and are used in Western medicine in some antibiotics, anti-cancer, anti-malarial, and anti-organ rejection drugs. A similar parasitic fungus was found in Indonesia in 2009 by researchers led by Dr Hughes. That fungus also turned ants into zombies, and they attached themselves to leaves a consistent 25 cm above the ground where the humidity was 95 percent, which provided perfect conditions for the growth of the fungus. According to Commonwealth Scientific and Industrial Research Organisation (CSIRO) entomologist Dr Steve Shattuck, there have been reports of several species of fungus parasitic on ants in the tropical rainforests of north-eastern Australia. Dr Shattuck said no one knows exactly how rare the fungus is, but it is hard to find. The study, published online in the journal Public Library of Science ONE (PLoS ONE), highlights the biodiversity found in the rainforests since the four different species were found in close proximity. The rainforests in the region are rapidly being destroyed, with over 92 percent already gone. Is this real? Micro/nano scope pics please? I wonder if the fungus releases 'reward chemicals' that increase as the environment (such as the humidity) more closely matches that which the fungus requires. The 'spaced out' zombie ant is perhaps just seeking out bigger rewards, a bigger 'buzz', as it wanders around before it dies, which makes it end up just where the fungus wanted? Is it possible that this could ever occur in humans? How do know that it hasn't happened to humans already? Do you guys know about morgellens? do you think it is of similiar class than this? Reading the comments at the popsci link above gives me a totally different view of the comments here at physorg. In mammals, the closest equivalent is the toxoplasmosis, the infected rat is not fearful from cats, and even seek cats, the parasit makes this in order to close the cycle and to infect the cat, people can be infected too, 1/3 of people actually are, the greatest source is raw meat, cats contribute to this too. Go and check how this change the behavior in humans, it is interesting and a little bit scary. "It is estimated that between 30% and 65% of all people worldwide are infected with toxoplasmosis. However, there is large variation between countries: in France, for example, around 88% of the population are carriers, probably due to a high consumption of raw and lightly cooked meat. Germany, the Netherlands and Brazil also have high prevalences of around 68%, over 80% and 67% respectively. In Britain about 22% are carriers, and South Korea's rate is 4.3%"
Is one of those effects on humans an unreasonable skepticism of the accepted scientific conclusions of the majority of scientists? This is kind of like the global warming deniers, most of the zomified by anti-science propaganda. Very creepy. Certainly it is reasonable that toxic byproducts of fungi might cause folks to believe that scientific truth is actually not determined by majority vote and solid consensus -- I'm sure that's it. Call a doctor, AC's a carrier. Ok This is really interesting, how could i know i am infected with toxoplasmosis? I am going to dig some research up. Like everything else you can give blood in the lab and they will say this to you, I doubt there is another way. I realize that, but i was talking about symptons, i did some research and there is alot of symptons you can get. I am making an doctor appointment on monday for blood test... I will get back here when i know more, if it interests any of you. There is fungi in grain and fungi in cattle. These the major source for people to consume. Add another fungi, yeast, and it becomes bread and a supplement for meat, wine. I guess, fungi that resides in the storage of grain or overlap in the herding space of cattle with it's defecation becomes a time/space elongation which turns people into culture participants. Now, how do you get people to reconsider their social perpective that they are zombies and can be controlled like ants in an operative environment with devices toggling like mice in a laboratory? If you're not living with HIV/AIDS, or planning on getting pregnant, you're not at any risk. Most people in the western world get it from exposure to pet cats. It is a very mild and easily conquered parasite. And the fear with pregnancy is that you have never been exposed and then become exposed while pregnant, where it can cause spontaneous abortion. It has. Its called Fox News. Zing! and knikiy nails it home. I love watching The Daily Show and seeing what these "journalists" will say and then a few months later, totally contradict themselves saying they "believe" in something different. And The Daily Show isn't left or right, it just points out when other news channels are idiots. And with Fox News, that's quite easy. If you're not living with HIV/AIDS, or planning on getting pregnant, you're not at any risk. I do have a cat. I read in wikipedia that they think it might cause depression, schizophrenia, or change in personality/behavior. Its logical that parasitic organisms change your body's chemistry. Its like being drunk all the time, absorbing substances to live and releasing it in different forms, especially harmful for your brain and liver. I have 2 cats kaas, and I won't be getting tested anytime soon. You really shouldn't let this newfound news scare you, but if you do go through with it, I'd be interested in the results. Yes, and once your immune system addresses the issue, you're no longer going to suffer from the symptoms as the parasites won't last long enough to cause these widespread chemical issues. I dont think its that simple SH. Sometimes disseases arent found even when they did certain tests to the disseases becuase the immune system dint make anti-bodies to the dissease and the test failed.